Despite living in towns only 35 miles apart John Logan Zink did not meet his future wife Kaitlin Zink until they both attended Olney Central College, a junior college in Olney, Ill.
"She lived in Newton, which is 35 miles from where I grew up in Lewis," John Logan said. "In high school we didn't know each other or anything, but I saw her play basketball a couple times, and she probably saw me play baseball a few times because our teams played in the same tournament." Now, as a married couple, the Zinks balance school and sports along with their relationship. John Logan is a junior second baseman for the Southeast Missouri State University baseball team while Kaitlin is a senior shortstop for the Southeast softball team. "We met at Olney Central College where I was playing baseball and she was playing softball," John Logan said. "We lived in adjoining apartments at junior college, so that is where we met." "They came over to hang out with me every day because I'd go there to hangout in between class and practice," Kaitlin said. "So they would see me there, and that's pretty much how it started." 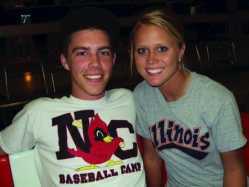 The two faced their first challenge in their relationship when Kaitlin was offered a scholarship to Southeast just a few months after they started dating in the spring of 2010. John Logan remained at Olney for another year. "It was right around that time that [Southeast softball] coach [Lana] Richmond had called me and had wanted to give me a scholarship here, and I didn't know if I wanted to do it or not," Kaitlin said. "He was the one that convinced me to do it and come here. We spent the summer together, and once we did long distance it was tough. We had Skype, but with him being in baseball and me being in softball it never really worked out to see each other, especially in the spring." After redshirting his freshman year and only playing one of his two years of eligibility at Olney, John Logan made the decision to come to Southeast in the spring of 2011. "I didn't want to be stuck there taking classes that didn't matter, and I wanted to go closer to where Kaitlin was," John Logan said. "I decided that I was going to go to Southeast no matter what and try and walk on to the baseball team here." On July 11, 2011, John Logan Zink made a decision that would change their lives forever when he proposed to Kaitlin Zink at his family farm. "We went and got ice cream, which was my favorite thing to do that summer, and we took it down to the farm," Kaitlin said. "His grandpa has a runway because he has a plane, so we drove down to the end of it and went on a walk. We were walking and it looked like it was about to storm, so I wanted to go. He kept saying, 'hold on' and kept saying cute things to me. He then said, 'Hold on, I need to tie my shoe,' -- his shoe was actually untied because I made sure to look -- and he got down and I looked up because it was lightning and he was on his knee with the ring box. "I originally thought he was just pulling my leg because I have my own ring box for one of my other rings and he always messes around, so I was thinking, you know, he is just messing with me. He opens it up and my ring was in there so he asked me and then we walked back to the car right as it started to storm." The two got married on July 8. They have faced challenges this year being in school and sports. They find it difficult to have the energy to do anything, and seeing each other play is a rarity. "God is the center of our relationship, that is our number one thing," Kaitlin said. "We don't really get worked up about anything really because nothing is really that big of a deal for us." "Both of us know that our number one relationship is Jesus and we both put him in our lives, then every other relationship you have is centered off of that," John Logan said. "Especially with the one with the person you love the most, it is going to be good and you won't fight about the small things because you want to do what is best for the other person."